… and optimize our older blog posts. Image source. A few weeks ago I was talking to Joe Chernov of HubSpot, a leading marketing software company with a very active blog community. As VP of Content, Joe’s role is to ensure that HubSpot’s content is consistently high in quality and driving valuable lead gen.
One of the surprising insights from our conversation was that Joe found that many of HubSpot’s older blog posts from prior months or even years were getting extremely high conversion long tail traffic. It turned out that people digging deep into the blog’s archives had a very specific pain point to address. Accordingly, HubSpot saw conversion rates much higher than that of their most recent posts, albeit at lower volume. This is why Joe’s team continues to tinker with older posts. 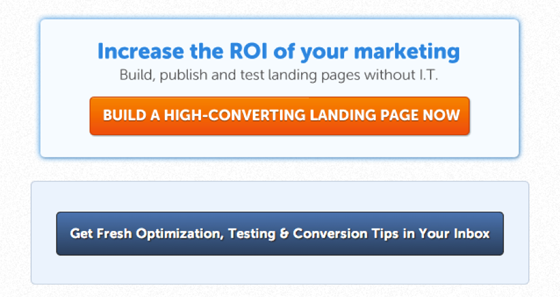 If it can work for HubSpot, it can work for you. Here are three things you can do to optimize older evergreen posts on your blog for long tail conversion. Many companies have very little visibility over all their content. As content marketers, our goal of near-term lead gen may sometimes trump the long-term goal of content planning. But as Joe saw, auditing older content can pay off in a big way. If you don’t have time or resources to do a proper audit, a quick way to get a better understanding of your content is to look at your analytics to see which content pieces are still driving traffic. While my blog has a shorter blogging history than HubSpot, I wanted to see if some of our older but still relevant blog posts could similarly benefit. It turns out there was lots of room for improvement. We looked through Google Analytics and our own proprietary analytics tools (which help us identify lead gen) to uncover our best performing pieces. 11 of our blog posts had the most call-to-action click-throughs, with one post blowing away the competition. I filtered out that post so I could see how the next 10 performed. To account for the advantages older posts have over newer ones, I normalized the referrals over elapsed time. Not surprisingly, our top converting posts were those with great relevance to content and inbound marketers, our largest user cohort. The best performing post was a summary of Rand Fishkin’s Reddit and Inbound AMAs (crowd-sourced interviews where interviewees encourage readers to “Ask Me Anything”). Both of these platforms offer a similar user experience, with Inbound catering to a user base very similar to our own target market. I wanted to see if referrals also correlated with our most viewed blog posts. Sharebloc found that referrals did not correlate proportionately with page views. It was interesting to see that the top converting posts did not correlate with the most viewed. The takeaway from this analysis is that posts that correlate better with buyer persona trump all other vanity metrics. Our relatively short content history made this exercise relatively easy. If your blog has a larger archive of posts, you may choose to focus only on the top quartile of your best-performing posts. Doing so will make the next two steps more palpable. Our blog’s older posts used to contain a plain hyperlink to our sign up page. As part of our optimization process, we went back and updated every link to a more eye-catching CTA, similar to the one Buffer uses in the example below. 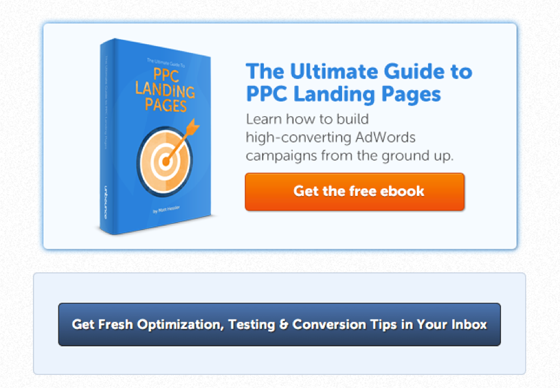 Buffer’s blog posts lead into eye-catching CTAs to turn readers into leads. Image source. This was a great improvement given our limited blog post repertoire, but companies with years of great content can do even more to optimize old but evergreen blog posts. For example, many of Unbounce’s older blog posts in their PPC category are evergreen pieces of content. When I scroll to the bottom of this older post I’m given the option of either signing up for a trial or joining their mailing list. 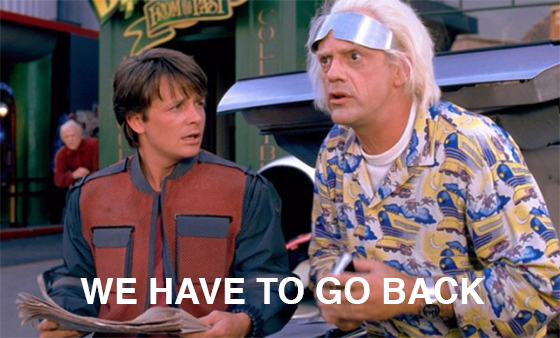 Unbounce has an opportunity to optimize this older but still relevant post by replacing the first CTA with a link to their recent ebook, The Ultimate Guide to PPC Landing Pages. Update older posts to reference new marketing assets. Image source. A simple quarterly audit of your most popular pages can help you guide older content toward more recent marketing assets. This post, The Anatomy of a Highly Shareable Infographic, immediately references an earlier post on the hard truths of content marketing. Since the post is light on content (and heavy on infographic), a user may be inclined to click through the older, content-heavy post for elaboration. This post, Finding Good Ideas, Internet Trolls & More, is simply a roundup of content posted earlier in the week. If you really want to get the most mileage out of past content, you can create roundups on a weekly or even a monthly basis as the folks from Crazy Egg have done. This post about Data Driven Fundraising is targeted toward a specific vertical. The author repurposes older, broader marketing content (such as this post on personalization) and reframes it for universities and non-profits. Before you consider deleting old posts, stop to think about the long tail conversion you could be missing out on. The team at Moz certainly found a traffic spike like the one above when they looked at the way their content performed. However, they also found that their evergreen content had a much longer life and continued to perform long after the original publish date. The same is true for your blog. Older posts can still add value to the top of your funnel. Keep this in mind next time you catch yourself abandoning older blog posts. If you’re producing great content, your work should continue long after you press publish. David Cheng is the CEO at ShareBloc, a Reddit-like platform for sales and marketing professionals to share, curate, and discuss business content that matters. You can find his writing about content marketing, social media, and growth hacking on the ShareBloc blog.